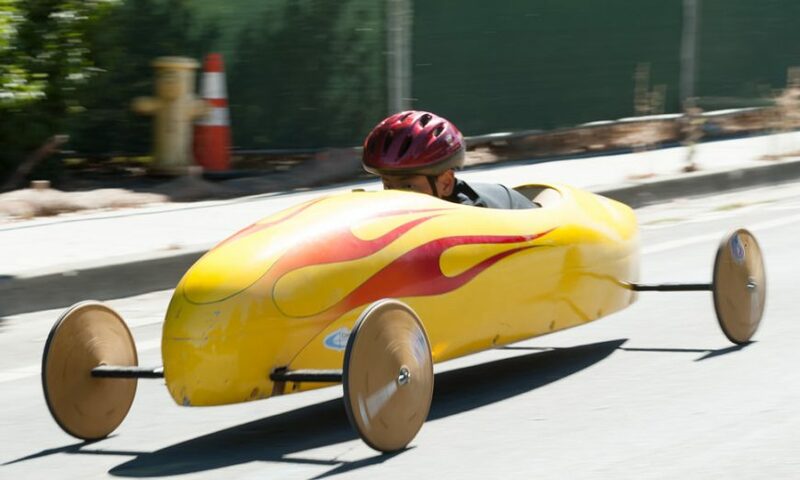 With the USA Slider Search in town, it was a perfect opportunity for the Silicon Valley Soap Box Derby to come to Palo Alto and share the road course and costs for renting Hanover Street for a weekend. The Silicon Valley Soap Box Derby has been around since 1934. It got its start in Mountain View but now calls Livermore its home. Drivers range in age from 7-20 years old and the organization is open to anyone who wants to try. To keep things even during the race and to prevent any one from taking advantage by using lightweight materials, such as carbon fiber, all the derby cars are all identical on the inside. There are three classes of cars — Stock, Super Stock and Masters. Super Stock is designed for young athletes that don’t fit into a Stock derby car. The Masters class is for older drivers and they have some amount of flexibility in what they can do to their cars. At the start of the races on Sept. 15 and 16, there was a drivers meeting where the rules of the event were explained. “Our focus is always on safety first,” Chris Harris explained. Each race sees two drivers pitted against each other — each race is timed. Additionally, to make things as fair as possible, after each race the cars are brought back to the start line and drivers change their wheels with their competitor. Having competed in the Slider Search, 9-year-old Palo Alto resident, Ida, was at the event with her father Simon Husse. For more information on the Silicon Valley Soap Box Derby visit their website: www.soapboxderby.org/silicon-valley.